This is a high-resolution 8.5 x 11” copy of the Virginia Cavaliers 2019 NCAA Basketball National Champs Sports Illustrated Cover, printed on high-quality cardstock (perfect for framing). The date is April 15, 2019 and the cover features Kyle Guy. Shipped via USPS First Class mail. 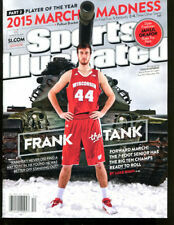 Please note this is not a full Sports Illustrated magazine, just a copy of the digital cover. Rare find. Not available on newsstands! MINT UNOPENED NEWSSTAND ISSUE featuring D WADE on the cover! Dwayne's interview about leaving the game! You need a few of these! ISSUE WILL HAVE A BARCODE. MINT ISSUE comes with backboard and acid-free wrap to preserve for a lifetime! 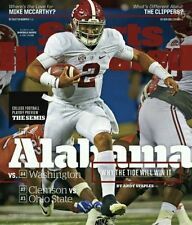 I have sold nearly 5,000 Sports Illustrated issues..Buy From The Best!!! PLEASE CHECK MY FEEDBACK!!! Buyer agrees to pay $4 for double-envelope shipping. Thanks for looking!!! THANKS!! Get it graded and it will grade out between 9.6 and 9.8. It has the insert inside. Unopened and unread. Perfect Gem Mint. Bought in 1999 and put away in a plastic holder. There is only1 Graded at 9.8 and2 at 9.6. MINT UNOPENED NEWSSTAND ISSUE featuring GIANNIS on the cover! I have sold nearly 5,000 Sports Illustrated issues. Buy From The Best! COVER SUBJECT - Muhammad Ali. Hobby Edition #92. Sold as is. OSCAR ROBERTSON & Bucks No. 1!, 10-26-70, First issue shown is EXC/MINT-NEARMINT & the other four are EXC-MINT ! - way above average - tight spine, no splits and no stains, unless noted here - See enlarged pic(s) to judge for yourself. Football Time In Tennessee Phil Fulmer,Heath Shuler 1993 Mint. Shipped with USPS First Class Package. 1st OSCAR ROBERTSON Sports Illustrated cover issue! Rare NO LABEL Newsstand Issue! May have a laser label.Only Newsstand or label issues can qualify for this grade. May have label expertly removed with barely noticeable glue lines. Huge Lot 25 New Magazine Publications New York Yankees 2009 World Champions Mint. Most are multiples grouped (see photos) plus a few singles related or not related to the world series (one has an address stamp. All are in mint condition. Shipping via priority mail USPS. THIS IS NOT A REPRODUCTION. 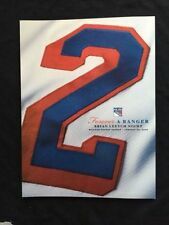 THIS IS A NEW AUTHENTIC PROGRAM/MAGAZINE THAT WAS ISSUED IN 1993 WHICH WAS PIAZZA'S ROOKIE SEASON. THIS ALSO HAS THE ORIGINAL UNFILLED OUT SCORECARD FEATURING THE DODGERS VS. THE COLORADO ROCKIES EXPANSION TEAM. APRIL 4 2011 SPORTS ILLUSTRATED NEWSSTAND ISSUE w/ THE PHILLIES 4 ACES ON THE COVER. Publisher: Sports Illustrated (2018). Single Issue Magazine. YOGI BERRA. NEW YORK YANKEES. CASE FRESH. 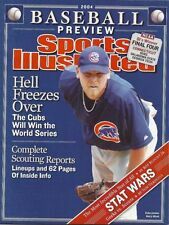 Nov. 2, 1998 issue of Sports Illustrated magazine in Gem Mint condition, featuring the World Series champion New York Yankees on the cover. See scan for details. Featured on the cover is Pittsburgh Steelers Vietnam Veteran running back ROCKY BLEIER. 6/29/1975 issue of Sports Illustrated Magazine cover copy. This is for a no label MINT June 22, 2015 Sports Illustrated Issue. 2 No. 4 MLB Mint. Book is in excellent condition. From a collection of yearbooks and. 1972-73 Inside Hockey Magazine, Boston Bruins Bobby Orr - Mint. 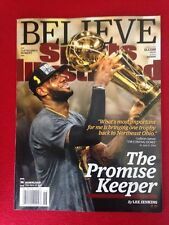 March 2th 2015 Sports Illustrated magazine w/ Giancarlo Stanton on the cover. Vintage Giants Magazine 1989 Vol. 4 No. 1 MLB Mint. May 9,2016 Sports Illustrated Magazine w/ Jared Goff on the cover. Original reprint of the famous 2014 Sports Illustrated Astros World Series prediction magazine. Item must be in itsORIGINAL condition. New. Will be shipped with cardboard insert and sleeve. Free USPS shipping. All sales final. Thank you. Slam Magazine June 2003. Jason Kidd cover. 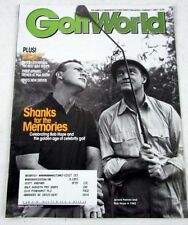 A SI dated April 16, 2001 featuring Tiger Woods on the cover. Get it graded and it will grade out between 9.4 and 9.8. It has the insert inside. Unopened and unread. Perfect Gem Mint. Bought in 2001 and put away in plastic holder. Cover features Reds first baseman Joey Votto. Dated 8/30/10 this is a newsstand issue in excellent/Mint condition and will be shipped in a magazine sleeve with cardboard backing. SERGIO GARCIA WINS THE 81ST MASTERS . Mint No Label Sports Illustrated featuring Peyton Siva on the cover from the University of Louisville. This Nov 11th 2012 college basketball preview issue was a regional issue and sold out right away in the Kentucky area. Michael Jordan Sports Illustrated SI Book A Tribute Special Collector's Edition Super limited. Hardcover Serial # 61838 Same day shipping! Featuring Midfielder Carli Lloyd - The Shot - After the Gold Rush. This is for a no label MINT July 20, 2015 Sports Illustrated Issue. Dec. 11, 2006 Sports Illustrated magazine in Near Mint condition featuring Dwyane Wade of the Heat on the cover. Sportsman of the Year issue. Note: This issue has a minor smudge on the middle-bottom of the cover, but it displays well. 2012 Bobby Valentine Red Sox Sports Illustrated Magazine. YOU ARE BUYING A NEW 2016 PETE ROSE CINCINNATI REDS HOF INDUCTION PROGRAM. THIS IS NOT A REPRODUCTION. THIS IS A NEW AUTHENTIC PROGRAM/MAGAZINE THAT WAS ISSUED IN 2016. Slam Magazine March 2002 Kevin Garnett cover MINT!!!!! Slam Magazine March 2002 Kevin Garnett cover. Features a poster of Jason Kidd/Stephon Marbury. DONT MISS OUT ON ALL THE OTHER SLAM MAGS I HAVE POSTED!!! 1972 Sports Review Hockey Magazine, Ken Dryden, Keith Magnuson - Near Mint to Mint. 1966 Sport Magazine (Mar. ), Boston Celtics Bill Russel, NO LABEL - MINT. January 19, 2009 SPORTS ILLUSTRATED NEWSSTAND ISSUE with Nate Washington and Santonio Holmes of the Steelers ON THE COVER!! This issue has NO MAILING LABEL -NEWSSTAND ISSUE and is in MINT Condition..It has a small barcode in the bottom left corner which all magazines have a barcode .. Free Shipping /Handling All my magazines come in plastic w/ cardboard backing. Slam Magazine December 1999. Kevin Garnett Cover. Features a poster of Shareef Abdur-Rahim/Kevin Garnett. There is a great article on Garnett in this one. DONT MISS OUT ON THIS AND THE MANY OTHER ISSUES I HAVE POSTED!!! NFL Beckett December 1994 Issue #45 Barry Sanders Detroit Lions - MINT! NFL Beckett March 1994 Issue #48 Rick Mirer Seattle Seahawks - MINT! MLB Beckett June 1995 Issue #123 Kenny Lofton Cleveland Indians - MINT! MLB Beckett September 1993 Issue #102 Darren Daulton Philadelphia Phillies MINT! NFL Beckett February 1995 Issue #59 Troy Aikman Dallas Cowboys - MINT! NFL Beckett January 1994 Issue #46 Troy Aikman Dallas Cowboys - MINT!